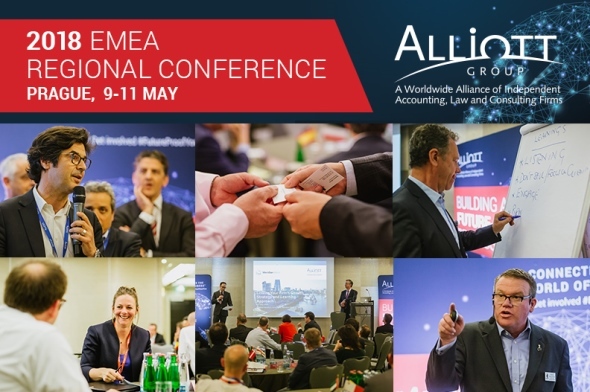 Professional staff members from John McKee Solicitors recently travelled to Prague to attend the EMEA Regional Conference of the firm’s international alliance of independent accounting and law firms. Themed ‘Building a Future-Proof Professional Firm’, the conference provided our professionals with insights into how they can become a more powerful, trusted resource for their clients in a world rich with opportunities but also facing significant challenges. John McKee Solicitors is a leading commercial law firm with a multi-jurisdictional team and specialist capability in financial services, dispute resolution, real estate and corporate legal services for international clients. Founded in 1979, and with some 150 member firms in 61 countries, Alliott Group (www.alliottgroup.net) is an award winning international alliance of independent accounting and law firms that need access to a larger resource base on an international basis to develop reputation, visibility and new business. Alliott Group provides services to help its member firms position themselves as the ‘go to’ firms in their local markets for businesses and private individuals with multi-market business interests. To find out more about how John McKee Solicitors can provide professional advisory support to clients doing business in different markets around the world, please contact Chris Ross or visit our website www.jmckee.co.uk.